Horikawa Kunihiro and Izuminokami Kanesada, two young Sword Warriors sent back to 1863, a turbulent period in Japan’s history, clash blades with the members of the terrifying Time Retrograde Army. These monstrous spectral creatures have also been sent back in time by historical revisionists whose aim is to alter the course of history by meddling in the past. And what better year than 1863 when Japan was divided into the two warring factors: the same time period and conflict that features in Peacemaker Kurogane. Four other Sword Warriors are soon sent to join them to make up the Second Unit, with Kanesada as captain – but there’s a problem. Hot-headed Mutsunokami Yoshiyuki, was once the sword of Ryoma Sakamoto – and his master was very much alive and active at this time. What happens if a sword encounters their original master? Will they forget their mission – and try to change history, swayed by tragic memories from the past? Kunihiro and Kanesada will also face this problem as they once belonged to Toshizo Hijikata, Vice Commander of the Shinsengumi. 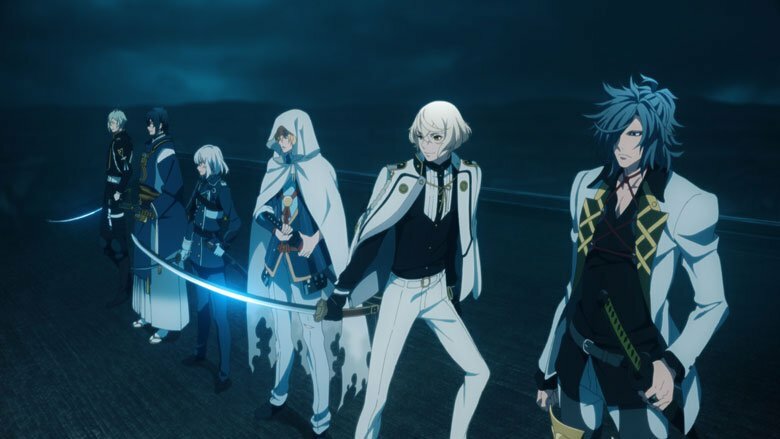 The Sword Master Saniwa is determined to stop the revisionists at all costs and has created a formidable band of tsukumogami, spirits residing within famous swords from Japan’s past now manifesting as young men who live with him at the Citadel. Saniwa uses the technology of the future, including cute kudagitsune (pipe foxes) who act as information conduits and facilitate communication between master and Sword Warriors. 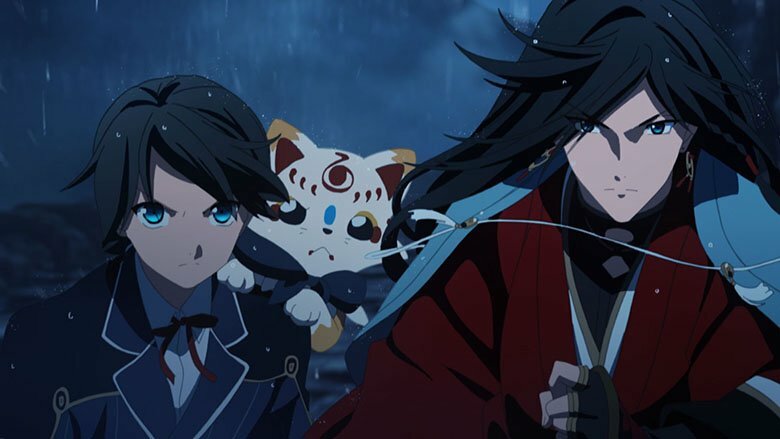 Sword spirits manifesting as handsome young men, an urgent mission to save history from being rewritten, epic battles with fearsome demonic warriors… Katsugeki: Touken Ranbu has all the ingredients for an exciting series with its mix of history, fighting and bishonen. And yet it’s often strangely unengaging in the first half of its run. It looks good, even if the charismatic sword warriors manifest with features and hair styles more suited to an idol group (there are eight character designers. Eight!) 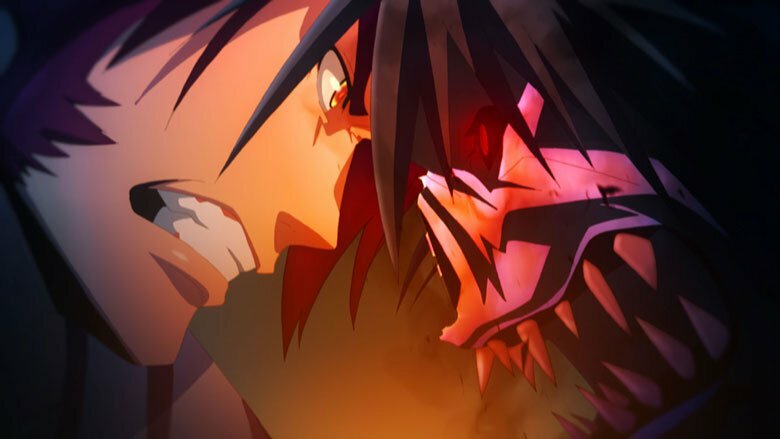 and the 3G is decently done by ufotable. The sword fights (with the skeletal revisionist warriors) are well choreographed (they brought in experts to join the creative team). So why is it so often lacking in drama? The fact that it’s based on a video game could be one reason: the warriors of the Time Retrograde Army may look scary and roar a lot but they’re just there to be defeated. When they’re run through, they disintegrate. They don’t have any discernible personalities so there’s no sense of tension for the viewer; it’s just ‘cut ‘em down before they cut you down’. The real drama lies in finding out who is pulling the strings in the future and why – but we never go there. It’s just a given. The series only begins to delve deeper – and become more engaging – in Episode 8 in the aftermath of the violent events the First Unit have been sent back to 1565. Faced with the dilemma that they can only protect history, but must not change anything, the conflicted Sword Warriors try to assuage their consciences by preparing food for the bereaved families of the warriors who have been killed. And back at the Citadel, Kanesada, the troubled Captain of the Second Unit, is still trying to come to terms with his own feelings of guilt because the members of his group nearly didn’t make it back alive from 1863 Edo. And it’s the last episodes, set in 1866, that bring to the fore the underlying sense of conflict for the Sword Warriors: what happens if – and when – they encounter their original human masters? How will they react, knowing how their beloved masters died? Will they be so troubled that they will be tempted to change the course of history themselves to give their owners a better future? 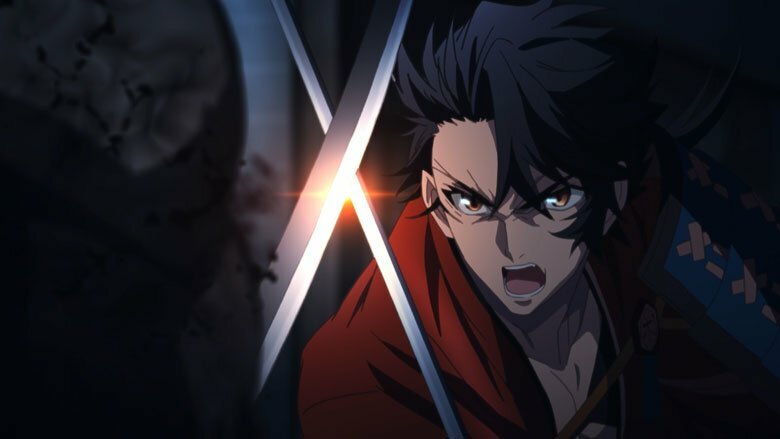 The collectible card browser video game that Katsugeki :Touken Ranbu is based on has a huge (mostly female) following in Japan and has spawned another two-cour TV series Touken Ranbu: Hanamaru set mostly in the Citadel and introducing a host of other Sword Warriors. Many of the fans of the Sword Warriors have done research into the history of the swords and recently ANN ran a story by Lynzee Loveridge about fans raising money to preserve the Ishikirimaru sword, a sacred blade forged in the Heian era. The sweeping orchestral soundtrack by Hideyuki Fukasawa has a tendency to play constantly in the background of the action scenes as if in a game (not surprisingly, he’s written a lot of music for video games). 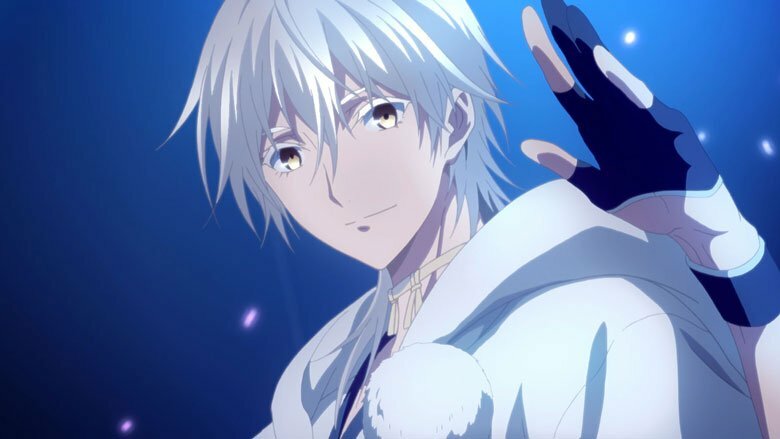 However to compensate, the Ending “Hyakka Ryōran” (Hundred Flames Blooming) written by Yuki Kajiura and performed by Kalafina, is just as good as one would expect, adding a striking conclusion to the episodes, even appearing at a key moment in the final episode to heighten the drama. The Opening Song “Hikari Dantsu Ame”, by Sōma Saitō, is rather more ‘does what it says on the tin’ for an action series. This Blu-ray release from MVM has excellent picture quality and sound and the subtitles are easy to read. Extras include the Episode Previews, textless opening and ending songs and some trailers. 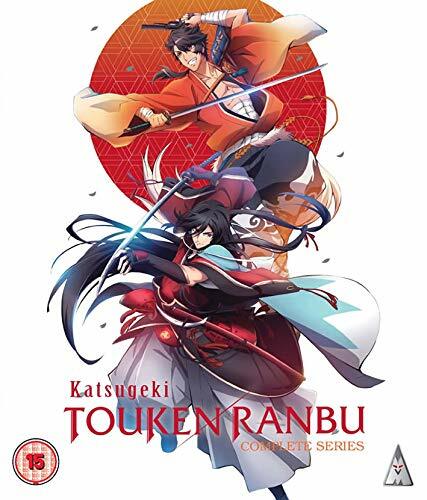 Katsugeki: Touken Ranbu delivers some impressive battles but the drama behind them is diluted and lacking in impact until past the halfway mark in the series. 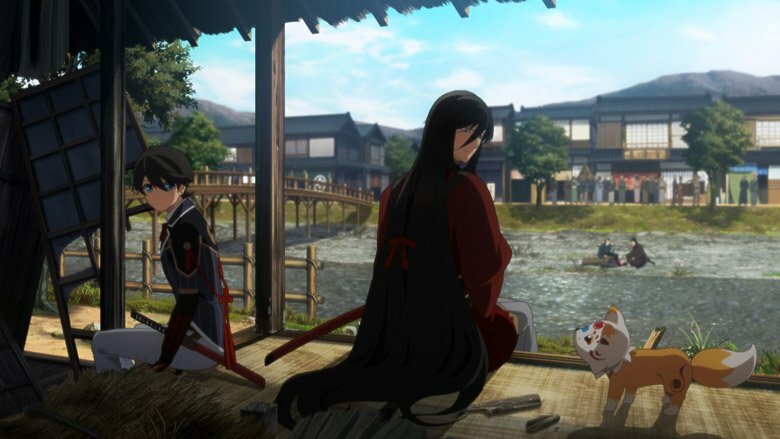 Nevertheless, even if you’re not a Touken Ranbu fan, this series will appeal to anyone with an interest in the two periods of Japanese history where the Time Retrograde Army strike – especially the time of the Shinsengumi. More BBFC Updates! Seven Mortal Sins receives an 18 uncut, Hi Score Girl rated 12, and more. Fate/Stay Night [Heaven’s Feel] Movie 1, Hi-Score Girl, Seven Mortal Sins and more have been rated over the past few weeks. A powerful piece of anime story-telling, Peacemaker Kurogane will appeal to all lovers of samurai and historical tales.